Subway is filmed mostly inside the more hidden parts of the Paris Subway. A young woman, Helena, is having an affair with a young blond man called Fred, Christophe Lambert. She is bored of her life and resents her husband planning her life out for her. She invites Fred to a party at her home, where Fred decides to blow her husbands safe and rob it. Along with whatever else he gets, he steals a file containing stuff about Helena. He then proceeds to try and blackmail Helena for 5,000,000 francs for the file back. Helena goes looking for Fred, but so does her husbands gangster friends and so does the Police. Fred disappears into the life that lives underground at a Paris subway station. The dropouts down there mostly live on pickpocketing and stealing from the subway passengers and shops there. 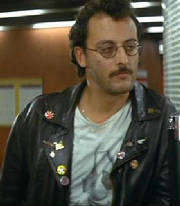 Jean Reno, is one of his friends, he's the drummer in the underground band. 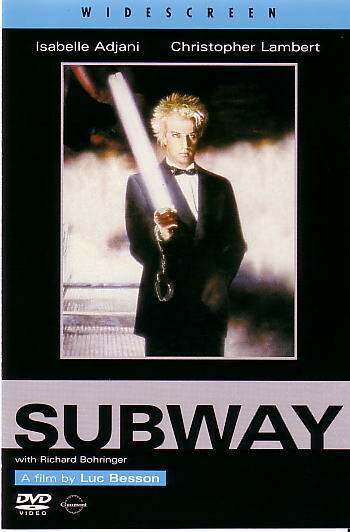 Fred has it in his mind to create a concert in the subway, he also holds up a train and takes the money. A lot of cat and mouse action ensues. It's a pretty good thriller on the whole. Jean looks very young in this film, I think as the years go by, they make him all the more handsome and sexier as he gets older.